I consider attending wine tastings a very important part of my job as Wine Steward at our Sandwich bed and breakfast. I see it as part of my professional responsibility to find wine to serve our guest at our Sandwich bed and breakfast. My search has taken me to many different settings. We all have seen the signs in our local liquor store: Free Wine Tasting Today. Back in a corner you find a store employee standing behind a card table or better yet, a makeshift table made out of stacked wine cases offering thimble sized plastic cups of wine. The wines may be billed as a “special” purchase, which may mean a cheap deal that the wholesaler talked the store into “blowing out” the inventory. Yes, I always stop and taste. So, what do you think I would do when I get the email that says “Tonight - The Finest Fine Wine Event Ever - 6:30 at Cotuit Liquors”? Even knowing my predisposition to the usual liquor store tasting as I described above, the headline alone got me to open the email and read on. The hype continued with “Featuring over 20 hard to find wines that NEVER get poured, at discounted prices”. They had me hooked. In my almost 20 years of visiting and living on the Cape, I have been to Cotuit Liquors many times and know they have a wide selection of wines and some very nice high end wines. The tasting lived up to the hype, it was coordinated by Wendy Koder a wine consultant and featured 20 wines from the Martignetti Companies, a major wine wholesaler. Wendy and a very knowledgeable team of Martignetti and Cotuit Liquors’ employees staffed three tables. As you entered the queue, you were handed a real wine glass and a list of the wines by table. Table One was seven champagnes, from Moet to Dom Perignon, from Blanc de Blanc to Rose and priced from $74.99 to $174.99. I have had the likes of Veuve Clicquot before, but never the La Grande Dame 1998 at $149.99, which was my favorite sparkling of the night. Table two had a mix of seven whites and reds; the only white I tasted was the Far Niente Chardonnay 2010. I served the 2008 at Thanksgiving and think the 2010 is also a great wine even at $51.99. I tasted four reds, two Pinots and two Merlots, ranging in price from $44.99 to $84.99. 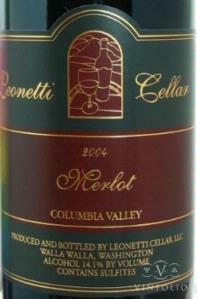 A new wine to me was the Leonetti Cellars Merlot 2009 from Walla Walla Valley Washington. It really caught my attention with a unique flavor profile, but at almost $85 it may not make to my guest wine list. The last table was six big reds from France, Italy, Napa Valley and Washington State and priced from $74.99 to $199.99. I tasted all and was excited by my first taste of two very well known Napa Valley Cabernets, Silver Oak 2006 and Knights Bridge 2007. A real treat was tasting the 2008 Doubleback Winery Cabernet, again from Walla Walla. This is a highly rated wine, Wine Spectator 94 points, from a new winery started by Drew Bledsoe of New England Patriots’ fame. Who knew Drew was also a talented winemaker with a big future in the wine game now that he is no longer playing pro football. The website says the 2008 is sold out, but we know you can still get it at Cotuit Liquors. In wine, a high price doesn’t always mean it is a great or even good wine, but in this case I think it sure made a difference. I had a great time and tasted some wines I have never had before mainly because of the price point. I will be keeping my eye out for the next in-store tasting to make sure I don’t miss an opportunity to find the next great wine for my guest at our Cape Cod bed and breakfast.